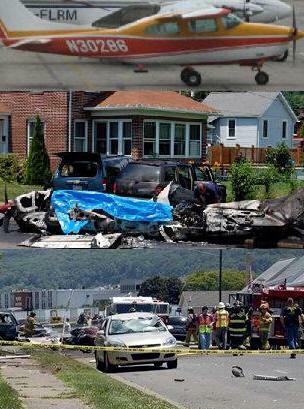 June 22, 2010 - On Monday a Cessna T210L, N30286 chartered by the U.S. Department of Agriculture crashed on approach to Lock Haven's William T. Piper Memorial Airport killing all onboard. At about 1 PM, the chartered Cessna aircraft crashed into a utility pole, a house and two cars west of the runway on its final approach. The chartered aircraft was owned and registered by Wings and Wheels 2LLC of Aurora, Colorado. Officials did not know where the aircraft was coming from, its final destination or whether more than three people were onboard. The aircraft crashed about 100 yards from the runway, bursting into a ball of flames. The pilot did not notify air traffic controllers of any problems other requesting normal landing instructions. No one on the ground was injured. The blue tarp on the Cessna 210 shields the three Forest Service workers who died in the plane crash. The FAA and NTSB are investigating this crash. William T. Piper Memorial Airport is a public general aviation airport located two miles east of the central business district of Lock Haven, a city in Clinton County, Pennsylvania. The airport was named after an American airplane manufacturer, and founder of Piper Aircraft Corporation. William Thomas Piper Sr. born January 8, 1881 - January 15, 1970, was an American airplane manufacturer, and founder, eponym, and 1st president of Piper Aircraft Corporation from 1929 through 1970. He graduated from Harvard University in 1903, and became known as "the Henry Ford of Aviation". The William T. Piper Memorial Airport is named in his honor. The William T. Piper Memorial Airport is located at the foot of the Bald Eagle Mountain ridge, between the West Branch Susquehanna River and its tributary, Bald Eagle Creek. It covers 112 acres, with two runways and is operated by the City of Lock Haven.